Flood lamps cure UV adhesives, coatings and inks very quickly, using moderate to high-intensity UV/visible light. These flood lamps are available as handheld, mounted or modular systems. A modular UV curing flood lamp consists of a power supply, reflector housing, and standard 400 Watt metal halide bulb. Shutter assemblies, mounting stands, UV shields, and additional UV curing bulbs are available to create a custom UV curing system. UV curing flood lights and focused beam flood lamps can be used in a wide variety of industrial applications including UV bonding, UV sealing, and UV encapsulating. Dymax UV curing flood lamp systems are ideal for use in the automotive, electronic, optical, and medical device assembly industries. 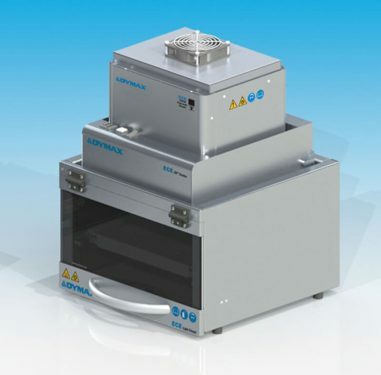 The Dymax BlueWave® MX-275 LED UV flood curing system provides manufacturers with the curing flexibility of other Dymax systems but in a small, efficient design with expansion capabilities. The Dymax BlueWave MX-250 LED UV flood curing system provides manufacturers with the curing flexibility of other Dymax systems, but with new expansion capabilities. The unit comprises two main parts: a controller with an easy-to-use touchscreen interface and a uniquely designed, high-intensity LED emitter, offering better uniformity and more consistent curing-energy emissions than traditional flood-curing systems. DYMAX UV Curing Flood Lamps offer moderate- to high-intensity curing over a 12.7cm x 12.7cm (5″ x 5″) or 20.3 cm x 20.3 cm (8″ x 8″) area. Curing in 5-30 seconds is typical using Dymax light-curable materials. DYMAX UV Curing Flood Lamps can be used as bench-top curing systems or integrated into automated assembly systems. The Dymax BlueWave LED Flood Curing Lamp System offers high-intensity curing energy over a 12.7 cm x 12.7 cm area. Cure times in the 5-30 second range are typical when using Dymax light-curable materials. This unit is simple to operate and can be used as a stand-alone system or easily integrated into automated assembly systems. IUV UV Curing Flood Lamps are high intensity, versatile, hand-held or fixed mounting UV lamps for applications including the curing of adhesives, coatings, and potting materials. They are suitable for many applications where a portable and mobile lamp is required. Phoseon Technology pioneered the use of LEDs for curing in both commercial and industrial applications, offering equipment manufacturers high performance curing technology that provides maximum UV energy, superior performance, and high reliability for demanding applications.